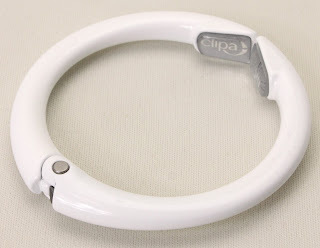 Gathering My Roses: CLIPA: Instant Handbag Hanger Review & Giveaway -- CONTEST CLOSED! 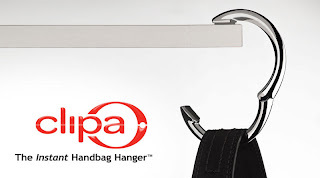 CLIPA: Instant Handbag Hanger Review & Giveaway -- CONTEST CLOSED! 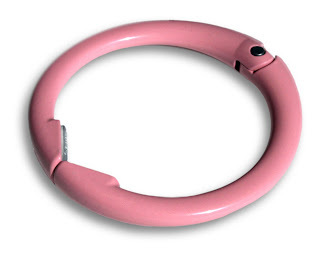 Not long ago, I was blessed to receive the Clipa, instant Handbag Hanger! It's not like other purse hangers that I've owned and used. It's actually quite unique in design and function. It's not just a hook -- it's a hanger! Does that make a difference? Oh, yeah. It does! The CLIPA is much more functional than the traditional-style purse hooks. Need to clip your bag on the fence at the ball game? You can do it! 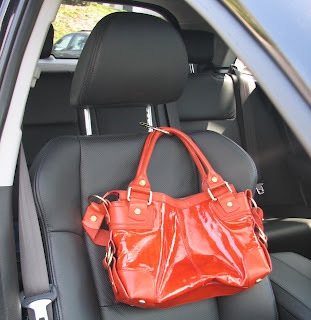 Want to clip your bag to the head-rest in your car or to the handle of your shopping cart? You can do that, too! It may also provide a health benefit you've never thought about. How dirty is your purse? Seriously. Carefully lift up your handbag and look closely at the bottom of it. Is it clean? Dirty? What's ON the bottom of your bag? Think about it -- have you ever had to sit your handbag on a public bathroom floor, or the floor of a cafe, or in the stands at a ball game? Now, think about the germs your handbag picked up and the bacteria growing on it now. ICK!!! Just read this ABC News article! It will open your eyes! Your Purse could be making you sick! 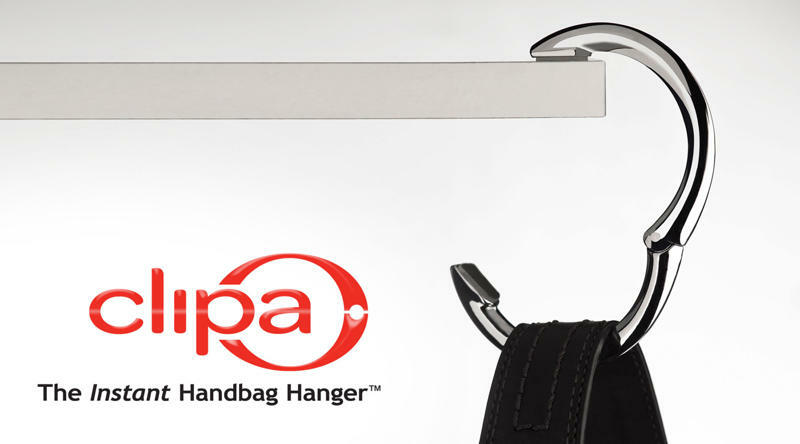 So, how does the Clipa, the instant Handbag Hanger work? Watch this great video and it'll show you everything you need to know. And believe me, you will never want to be without a CLIPA ever again! 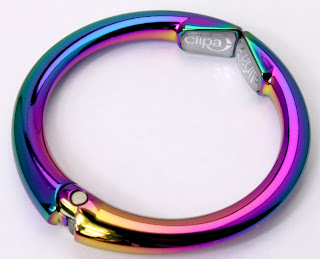 CLIPA is not only a fantastic purse hanger, it also serves as a truly fashionable piece of jewelry -- it can be worn as a bracelet or bangle when not protecting your handbag from dirt and grime. Clipa is very durable, made of heavy duty construction. It can hold up to 45 lbs! Non-slip bases on both clip pads protect the surface area where you hang your bag and keeps it from slipping off onto the ground. As you know, Liz and I are deeply concerned with women's health issues and we support companies that give back to the community. According to the American Cancer Society, breast cancer is the second leading cause of cancer related death in women. 1 in 8 women will be diagnosed with breast cancer this year. Clipa is a supporter of The Breast Cancer Research Foundation. 10% of the retail price of every Pink CLIPA (Known as Clipa for a Cure) is donated to the BCR Foundation! We thank CLIPA for their dedication and service to Breast Cancer Research! The wonderful folks at Clipa have offered one of our lucky readers a chance to win the beautiful Spring Edition Taylor Clipa in White! MANDATORY ENTRY: Visit Clipa and tell me TWO things that you learned about CLIPA that I didn't mention here. Come back and leave the info in your comment. If you do not post the mandatory entry, your other entries will be discarded! 1. Follow @theClipa on Twitter. 2. Fan Clipa on Facebook and tell the Terri & Liz from Gathering My Roses sent you! 3. Subscribe to CLIPA's Free Newsletter. 5. Follow @GeorgiaMist on Twitter. @GeorgiaMist @theClipa Win a CLIPA "Taylor" from Gathering My Roses! Ends 4/2/10. DISCLOSURE: We received a complimentary CLIPA for the Cure for the purpose of review. We were under no obligation to review this item. We received no monetary compensation. The opinions expressed are based on our own use and experience with the item. 1.products are manufactured in the U.S. from North American parts, keeping jobs here at home while reducing our carbon footprint. I would follow you on facebook but the video imbed was covering it up!! I subscribed to CLIPA's Free Newsletter. I learned that it comes with a 1 year warranty and that it can be worn as a bracelet. I entered The Derin Collection Giveaway. Clipa Facebook Fan - Janet Fri and I left the message. I learned that if you buy 3 it ships free and it comes with a 1 year warranty. I like the hidden automatic closure unit. Thanks for the chance. You can wear it as a bracelet and for material safety it passes proposition 65 tests for toxic materials. I learned that it works on tabletops and counters which is a plus for me. I also learned that the product is made in the US. I learned that it is made here in the USA and that it has a one year warranty! fan of the clipa on facebook and left message. These are made in the US and when you buy 3 they ship free. i learned that it never needs to be polished and that it holds up to 45 pounds! I follow clipa on Twitter @DolphinV27!